There are many benefits of outsourcing your publication, whether print or digital. Businesses and associations of all sizes need a way to communicate to their target audience. Publications are a valuable part of that communication. These days, publications range from magazines and newsletters to digital publications. If you’re looking to launch, enhance or increase advertising revenue, consider the many advantages of outsourcing your publication. The demand for outsourcing in publishing continues to rise, according to a recent Just Content whitepaper, in collaboration with BookMachine, which looked at how the publishing industry has evolved from working solely in-house, to outsourcing work. Let’s face it, saving money while maintaining quality is critically important for any business or association. If your business sells widgets, outsourcing your publication means more time for you to focus on selling those widgets, while subject matter experts create robust print and/or digital publications, that supplement your goals. When you think about creating high-quality content, who do you turn to? Often times, it’s your high-level industry expert because he or she has the most knowledge and insight. This presents several issues, from a cost and time perspective. Often, that person is not skilled in writing that type of content. Therefore, it takes more time and effort for them to turn around copy, as well as additional time to go through the editing process. It’s also at the expense of taking them away from running their day-to-day operations, as I referenced in the widget example. When that part of the process is outsourced, skilled writers interview your expert—which typically takes no more than 15 minutes out of their day for an article—and will turn around first-class content. At that point, your expert just needs to quickly review and approve the content. This is one of the biggest areas of cost savings. Others include less publishing costs, because an outside company often has a full range of custom publishing services and state-of-the-art technology to produce a number of publications in house. This enables businesses or associations to produce attractive magazines, internal newsletters, and/or external marketing materials at a good cost. When experts do the work, you’ll not only realize a cost-savings, but also will produce a high-quality publication. A business or association would have to hire new staff members or extend those you already have, to produce a weekly, monthly or seasonal publication. Companies who manage this type of work have the capabilities and experts in each of those areas, to handle every aspect of the publication process including content creators, editorial, creative designers, advertising sales, production and printing—all under one roof. At CMA, we have experts in each area to oversee everything from design to advertising sales, topic sourcing, layout and print management. We staff former journalists and editors, who ensure grammatically correct copy, written in AP Style. In addition, they have the skills to generate insightful and in-depth stories, which are cohesive and engage a larger, more incisive audience. CMA also staffs creative copywriters, who build the foundation for each issue, while outlining and fabricating attractively robust pages that increase engagement. Through outsourcing your publication with CMA, you’ll have a dedicated editor for your publication, which will know and understand industry trends and write articles to help drive your brand. He or she also will look at your publication, with a fresh perspective, and devise ways to stretch your dollar and amplify your target audience reach. One way is to repurpose articles, as blogs, which also will increase your SEO rank. Turning print content into digital content is an effective way to stretch your dollars and reach. CMA also tracks engagement with the digital publications it produces. We provide data—such as open and click rates, as well as bounce and subscribe rates—to help guide sales efforts or other overarching goals. A newsletter, print or digital, can be one of the most important engagement tools. While you might treat them like an afterthought, a quick e-blast can directly impact your target audience. CMA experts create and/or curate content and distribute it to help build relationships and establish authority. One of the many benefits to having a publication, is the opportunity to generate advertising revenue. You can accomplish this through selling advertising space, in your print or digital publication. An outside partner can handle that entire process, from developing a plan and sales materials, to identifying opportunities and targets in the marketplace. The final step is selling advertising space on your behalf. All of this is a time-consuming and arduous process, especially if you don’t have the staff to handle it or the expertise to create and sell the advertisements in house. That’s when outsourcing your publication also makes sense. With more readers expecting to access their reading material online, CMA creates digital content, which enriches the brand experience, while providing advertising opportunities and increasing revenue—using the latest technology. CMA relaunched and has been managing an industry publication for IMARK Group, a member-owned marketing group made up of more than 830 independently owned electrical distributors throughout the US. Member companies serve their local customers, from more than 3,000 branch locations. With more than 18 percent of the US electrical distribution market, the members of IMARK Group constitute the largest member owned, member governed cooperative in the US electrical industry. 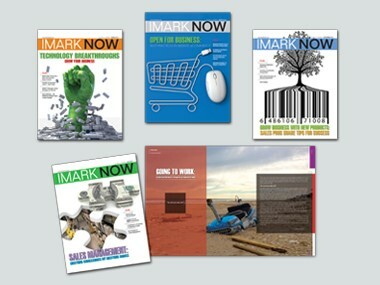 With the acquisition of an industry competitor, IMARK Group sought a complete overhaul and relaunch of the 100+ page publication, IMARK NOW, to reflect their expansion. Through a graphic design makeover, CMA delivered a magazine with more editorial impact, immediacy and value. CMA also created and launched Card Manufacturing (CM) magazine—which started as a newsletter, Transaction Times—for International Card Manufacturers Association (ICMA). ICMA is the leading global card association for card manufacturers and personalizers supported by suppliers and other industry participants. CMA has been managing ICMA’s official publication for nearly 30 years. The magazine engages the global card industry and positions card manufacturers, personalizers, principal issuing organizations, industry suppliers and service providers on the forefront of change and business success. It also explores regional and global market trends, as well as new and innovative ways to apply science, engineering, tools, methods and knowledge to the development of materials, equipment, products and services that will drive the use of cards around the world for years to come. Additionally, each issue is distributed via email, to thousands of industry professionals where businesses can advertise and link directly to the ICMA website. In addition, the magazine is posted on the website, for visitors to read, with links to past issues. In today’s world, where all resources are stretched, it makes sense to turn to the experts when outsourcing your publication. Do you believe outsourcing your publication could be the right step for you? Contact us today, to get the conversation started. Jeffrey Barnhart is President and CEO at CMA, a full-service communications, marketing and association management firm, which has provided its clients with award-winning and proven results for more than 30 years.